Aluminum Beams, constructed from extracted aluminum, are widely used when greater strength and corrosion resistance are required. 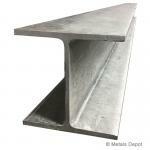 With inside radius corners, aluminum beams are used in framework, rails, overhead support, trolleys, and more. Aluminum beams cut, weld and machine well. Shop for Aluminum Beam Online! Shop for Galvanized Steel Beams Online! 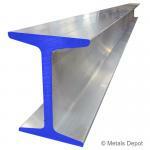 Metals Depot supplies both "H" and "I" beams in a range of standard and customized cut-to-size dimensions. Structural Steel H beams have wide non-tapered flanges and are used in residential and commercial construction, vehicle bed framing, bridges, machine bases and more. 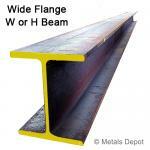 Structural Steel I beams have tapered flanges that make them strong then H beams. They are also broadly used in residential and commercial construction, vehicle bed framing, bridges, machine bases and more. Shop for Steel Beams Online!